Five years ago they’d been six friends at university that laughed hard and loved harder. Nicky and Miles, the couple that were always meant to be… Leigha and Adam, maybe not. So when Harriet and Adam grew close, during those long summer days in the library and too many seminars they (well, Adam) hadn’t prepared for, they did the one thing that changed everything. They kept a secret. And when it came out, the trust was broken. When the day comes for bridesmaids to be chosen, and best men to fulfill drunken promises, Nicky and Miles’ wedding isn’t just a wedding, it’s a reunion – loaded with past hurts, past regrets, past loves. Can you ever relive those uni days – or would you ever want to? 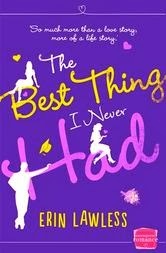 The Best Thing I Never Had is in turns funny and sad, but always honest, about friendship in all its forms and the practicality of second chances. The buzz was pretty positive, and I liked the idea of a book about the relationships between a big pool of people in university. I loved this book. Personally, the characters really resonated with me. It's easy to sympathize with the ups and downs of close friendships, the trials and tribulations of wanting to date within your pool of friends, the drama of crushes alongside the difficult process of making life-altering decisions about career and family. I found reading the material about the university years a lot like slipping on a favourite pair of slippers - cozy and warm and snuggly. Yes, there's a lot of hurt and stress and Drama! but there's also a lot of joy and discovery and potential. My first impressions were rapidly sundered as my heart started to break for one of the characters. The chapters involving the wedding were also excellent. I've experienced that feeling of picking up right where you've left off - unfortunate that for so many of the characters involved that meant emotional pain and having to revisit old wounds. Certainly a little bittersweet, but hopeful, I think. Sometimes it just takes a little faith and a willingness to look through someone else's eyes. Lawless packs so much into each chapter - the only way you might consider this a quick read is if you get as hung up on it as I did. I was left thinking about whether or not it's possible to go back and recapture friendships from our youth, what moments we can revisit and which are lost to the distance (in years). I couldn't put this down! Buy it! Read it! Love it! This book is a steal at ebook pricing. I'm already thinking about re-reading it. For fans of good books.